Rootworms have proven they are one of the most adaptive pests known to corn production and that they are gifted at developing resistance to our best pest management techniques. The resistance story begins decades ago, it stretches through the mid-90s, and it continues today. Today’s part of the rootworm resistance story largely revolves around the subject of trait-resistance. It began just a few seasons ago in Iowa when university researchers confirmed the pest had developed “in-field” resistance to the first rootworm trait (YieldGard). The story was soon followed by confirmed resistance in Illinois. In 2013, rootworms made themselves well known in the northern portion of the Burrus footprint with fairly extensive rootworm injury (92% of growers attending our Fairbury, IL winter agronomic meeting encountered rootworm injury within their neighborhood). The update on trait-resistant rootworms can best be summarized by saying that they have “expanded their territory and their feeding habits.” According to the University of Illinois - Sangamon, McDonough, and Mercer counties have now been added to the list of Illinois counties with confirmed trait-resistance. Researchers at Iowa State confirm that rootworms have now developed “in-field” resistance to the Agrisure rootworm trait as well. Burrus Account Managers were at the forefront of the 2013 rootworm battle and provided valuable “intel” on rootworm injury “hot spots.” Their observations helped Burrus conduct a series of root digs in suspect areas. While we cannot state anything about rootworm resistance based upon those surveys, we can state that suspicious levels of feeding did occur. 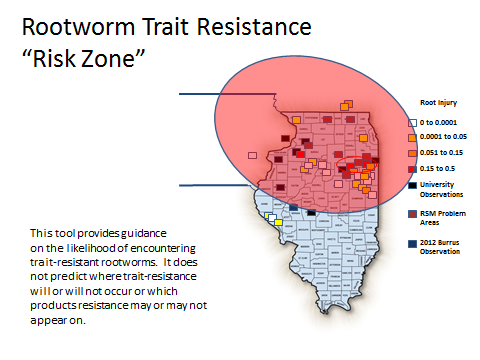 We believe that survey granted us a picture of the resistance distribution and currently feel the most “at risk trait-resistant rootworms zone” is represented in the red highlighted area below. So here is the score. Two traits now have confirmed in-field resistance. All traits have been overcome by resistance in the laboratory (indicating that resistance is possible). Burrus encountered “chew through” events in every available trait during 2013 (not confirmed resistance, but cases in which the pest inflicted significant injury on traited products). The territory for rootworm resistance also appears to be expanding. Nothing waits in the pipeline to save us if all traits eventually fail. Burrus reiterates that point here. It is essential that growers manage resistance now. Rotate rootworm traits, rotate to soybeans, and strictly follow refuge guidelines. It is equally essential that growers scout their fields this season. Minus scouting information, we have advised that insecticide be applied with trait to ward off significant rootworm injury within the red “At Risk” zone (in picture above). That recommendation is a “just in case approach.” With no information about a field, it is the best recommendation we can currently provide. However, that kind of blind approach is not ideal and its continuous use is unsettling. 1) Record your gut feeling about the rootworm beetle population when walking the field in traited acres during July and August. 2) Dig roots in July and August to evaluate rootworm control in traited and refuge acres. 3) If the rootworm beetle population is high and root ratings of rootworm traited hybrids are 0.25 or higher use a granular insecticide the next year. 4) Keep annual records of your observations. 1) Scout rootworm-traited acres at pollination. a. Start at the bottom of the plant. b. Count beetles on the leaf surface, leaf axils, stalk, ear tip, and tassel. 3) Divide the total number of beetles by the number of plants examined to determine the average number of beetles per plant. 4) If the average rootworm beetle population is 0.75 beetles or greater per plant, consider using a soil insecticide with rootworm traits the next year. 5) Should the rootworm beetle population be less than 0.75 beetles per plant, wait two weeks and scout again. 6) When the beetle population remains low for six weeks after the scouting trip, no soil insecticide is necessary with rootworm traits the next year. Remember, if scouting appears to indicate that an insecticide may be needed with trait – Syngenta is offering a rebate on purchases of Force Insecticide with a minimum purchase of units of Agrisure rootworm corn. Do You Have Corn Rootworm Problems? Burrus Hybrids with Various Trait Platforms Can Help! Burrus customers aren’t limited to just one trait platform for corn rootworm. We have strategic alliances with major companies for wide access to the best germplasm and industry-leading traits. The Burrus multi-brand strategy for corn and soybeans means more choice and higher profit potential. Consider using a soil insecticide or Poncho 1250/Votivo in addition to rootworm traits as a different mode of action and for added protection against corn rootworm. Are you Afraid that Cool Temperatures will be Bad for Yield? We recently plotted nine years of USDA yield data as a function of low temperatures (information captured from the entire Burrus footprint). The results are not surprising on beans. Frankly, we expected yield to be stronger when July is dominated by cool temperatures. When temperature remains too high, beans have a nasty habit of burning off more yield-producing “good stuff” than they create (the technical term is called ”photorespiration”). The results are also pretty close to what we expected for corn. While cool July temps are not an ideal scenario for getting grain filled quickly, cool July temps do not necessarily kill corn yield either. Once July is over, the actual impact of temps on yield begins to taper. Burrus believes that resistance is the single greatest agronomic issue facing growers, and we also believe resistance will continue to be the greatest single threat to productivity. We have often noted that agriculture faces the uncomfortable dilemma of having only a limited number of pest management tools, many of which are being lost to resistance (pests adapting to the point that such products no longer prove effective). If the issue of resistance has been displayed anywhere throughout the Burrus footprint, it has been dramatically displayed in the arena of weed management (especially in the arena of Roundup resistance). Growers need to ambitiously scout their fields. The weed resistance battle is a war. It is a war that, if lost, will dramatically increase the cost of production while decreasing yields. It is not dramatic to say that its’ outcome will define the future of agriculture. As with any war, winning the battle requires good intelligence. You have to know the nature and status of your enemy. Weeds are that enemy. Growers need a clear picture of historic weed pressure in each field. Detecting a problem requires such a reference point. They need to know the spectrum of weeds they have to deal with, and they should know if recent history has changed any part of that story. Windshield observations cannot provide that type of insight. Professional crop scouting can help, but surveying the field must also become part of the grower’s daily routine (if it is not already). Grower “boots on the ground” are essential. Growers need to engage in a “lockdown” strategy. “Lockdown” is defined as “a state of isolation or restricted access instituted as a security measure.” We have already stated that resistance represents one of the most significant threats to 21st century agriculture. It might be a little dramatic to say that resistance is an “agricultural security” issue, but with that said ….. the statement really is not too far from the mark. When an issue of security arises, a first logical step toward winning the battle is to limit access. In this case, the enemy is resistant weeds and we need to restrict current and/or future access to the field. First, we need to remove suspect weeds where present to eliminate seed production (even if only a few and even by hand if necessary). Second, we need to remove suspect plants that reside near a field (elimination of suspect weeds along road sides comes to mind via hand removal or by mowing the field previous to seed production). Third, we need to avoid those areas infested with suspect plants during harvest (removing those plants from the field soon after harvest or mowing them down minus incorporation to increase seed mortality). Fourth, we need to avoid using products, materials, or equipment that could harbor seed from resistant plants (no more hitching a ride into fields). Growers need to give herbicides a fighting chance. One of the quickest ways to encourage herbicide resistance is to expose a plant to “less than lethal” amounts of herbicide. Skimping on rates is one example of “less than lethal”/resistance encouraging herbicide exposure. However, there are many ways to create “less than lethal” exposure. Applying an incorrect rate for the size of plant, applying a product with the knowledge that rain may soon wash a lot of it from the plant, poor coverage, etc. all create a “less than lethal” exposure event. Growers need to move beyond number 9. While the list of herbicide resistance concerns is long, we would lie if we did not admit that glyphosate/Roundup resistant weeds are “the” weed resistance topic at the moment. Glyphosate is cheap and until recently, it has been very affective across fields. This resulted in repeated high use of Roundup which created lots of selection/resistance pressure. Glyphosate is classified as a HRAC 9 herbicide (HRAC stands for Herbicide Resistance Action Committee). A truly affective resistance management program must move beyond reliance upon only HRAC 9 (or any single HRAC group for that matter). Other modes of action should be used in place of HRAC 9 or other frequently used modes of action. Other modes of action should also be used before or along with HRAC 9 (glyphosate) or other frequently used modes of action as well.